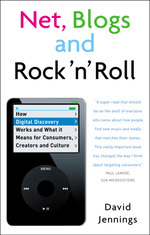 The title of the book is Net, Blogs and Rock'n'Roll, but the amount of coverage of blogs per se will be relatively small. I use 'blogs' to stand for the more general growth of user-generated content (including wikis, forums, photo-sharing etc) and its cultural implications. These implications in turn affect the circulation of word-of-mouth recommendations, the development of 'buzz', and thus some of the ways in which people discover new music, films or other entertainment. a part of wider activity of personal networking, finding like-minded souls, and building communities of interest. In the spirit of "no final word", please post a comment if you'd like to add, subtract or change anything on this list. * Is a blog that has the thinly-veiled purpose of promoting a book 'not what the culture of blogging is really about'? I thought I'd better get that one in, before someone else did.